Want to become Tally with GST Accountant ? Tally ERP 9 Expert Training Course covers in-depth knowledge to meet the accounting requirements. Digital finance offers a solution for financial inclusion which is Powered by the smartphone. A Specialized course for the skills development in the vibrant field of Accounts, Finance, Banking, Taxation. This course is designed to aim at imparting a basic level appreciation programmed for the common man. Advance level of Diploma in Finance & Accounting Course which cover advance course module. Starting out, small or medium sized, cloud-ready or not, we’ve got an affordable solution for you. Our Institute provide acquire skills required to operate Tally Accounting Package, Report Generation, Taxation aspect etc. Our Tally ERP9 (With GST) and Accounting & Financial Courses are Certified and Approved by MIT, Govt. Of India. We are TALLY Government Authorised Coaching Center in Ahmedabad, Gujarat. Hello friends, myself Sameep Pramod Jain. I was joined DIGITAL MEDIA GROUP for tally erp 9. This was the best institute that I have ever seen. I completed my tally course in just a easy way and in a short period of time, in this institute all teachers are helpful about their course. 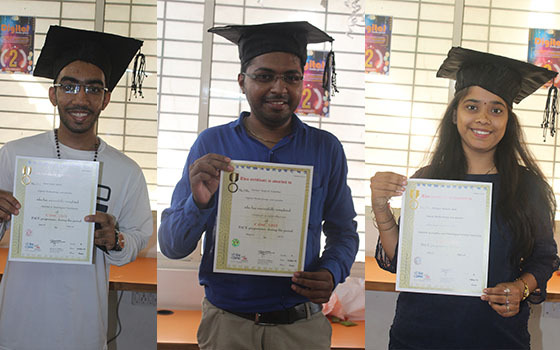 Creative IT Engineering & Multimedia Institute c/o Digital Media Group is one of the best computer training institute in ahmedabad, I have successful completed my Computer Fundamental Course "CCC" and Spoken English from this Institute, My personal experience with institute regarding faculty members is very good. Submit your email address we will arrange your Free Demo.